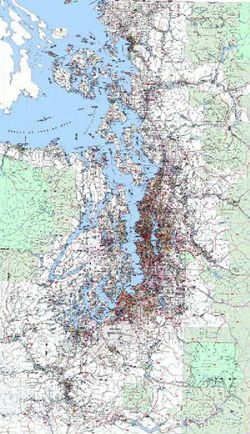 Greater Puget Sound Arterial Zipcode Map by Kroll Map Company (local Seattle mappers) covers from Blaine to Centralia, and from Shelton to North Bend showing ZIP Code boundaries, major metropolitan thoroughfares, and city names with boundaries. This zip code map, covering Seattle, Bellevue, Everett, Marysville, Bellingham, Olympia, Tacoma, and more has arterial road detail to compliment the zip code information and is unmatched in coverage and detail for a map covering such a large region! King County Zip Code Map by Kroll Map Co.